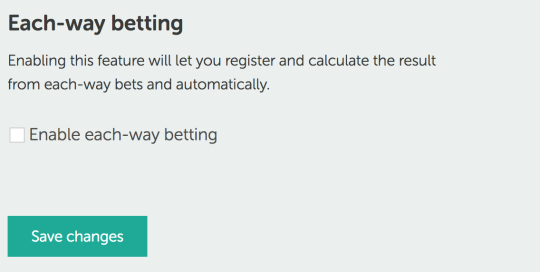 Bettin.gs blog – The easiest way to track your bets and manage your betting portfolio. Finding tipsters to follow isn’t hard at all nowadays. There’s no shortage of tipster websites, free to join Facebooks betting groups or loud people at Twitter who seem helpful enough to share their expertise and make you rich. The challenge is finding serious, honest tipsters that can actually help you make money and do it for a long time. While it certainly doesn’t look like it at first glance, the truth is almost everyone loses money in sports betting, except for the bookmakers. Tipsters are no exception, so be ruthless in who you decide to follow. Here are just a few tips (pun intended) to help you on the way. Needless to say, a track record is absolutely and fundamentally a prerequisite to even start thinking about following someone’s advice. And by track record I don’t mean 1000 tweets summed up with “a 75% strike rate” or a random Google spreadsheet that leaves no guarantee that it couldn’t have been adjusted. Screen dumps from bookmaker accounts doesn’t count either. I’m talking about letting a serious third party like Smart Betting Club verify your bets, or register and lock them all at Bettin.gs. All bets at Bettin.gs are public and locked bets can’t be altered once they are locked and registered. How many bets that are needed depends on the odds, but for bets odds on (2.0 or 1/1) I’d recommend at least a couple of hundred, much rather a thousand. Yes, that’s right. 1000 bets to make sure it’s just not a string of lucky results, but actual skills, that are behind the results you’re seeing. You need to ask yourself why these people are selling their tips. If they are one of the very few that actually have found a flaw in the bookmaker’s models, why would they want to share that edge? Valid reasons could be they don’t have the money to invest themselves, the bookies won’t allow them to bet as much as they’d like, or they just want to even out the volatility in their business by having a guaranteed flow of income on the side. Invalid, but sadly very probable, reasons are usually that they are affiliated with a set of bookmakers and want you to lose as much as possible so they can get a share of those losses, or more likely they don’t have an edge at all so their only chance to make money is to charge for losing tips. Now, if you’ve found a tipster service that actually have a proven track record of winning bets, they seem legit and you want to have a closer look at what they have to offer, what would you look for? Apart from the obvious, like what sport and language that is used, you should look closer at the following. What are the odds and strike rate? What odds ranges are being used? If it’s lower odds, you should be able to win less but more often, which means you’d need a smaller betting bank and the losing runs will be shorter. That might feel safe, but don’t expect your bankroll to grow too quickly. Higher odds means winning more rarely, but more when you do – and hopefully more in the long run. Tipsters using higher odds obviously needs more bets to prove their worth, but could be worth it as the chances to find bigger value increases with the odds. On the other hand you’ll need a bigger betting bank to deal with bigger drawdowns and that psychological rollercoaster that it measn is definitely not for everyone. Are the bets advised for someone to win, to lose, for amount of goals or something completely different? Is it win only or each way? Is it for games the same day or season bets/ante posts? Does this suit you? Do you have access to the bookies that offer these kinds of bets? Is it possible to get the quoted odds? It’s quite possible you find the best tipster on the Internet, but since he’s so good there’s so many following his tips that the odds disappear within seconds once the tips are released. It’s also possible, and more likely, that the quoted odds are the best one available and not a resonable odds to acquire. Make sure the odds advised are odds that are offered on the market! Are they beating the market? One way of analysing if they’ll be profitable is if they’re beating the closing odds more often than not. That is, are the advised odds better than the odds available when the event starts? Those odds are usually seen as the most correct. There’s a feature att Bettin.gs that let’s you track this easily. What are they basing their bets on? Is it based on a computer based model, insider info or public knowledge? Is this important to you, or do you just want the odds and the selection? How does their time schedule look? You’re probably not doing this full time and probably not by your computer all day, every day either. Are the tips predictable and arriving on the same time every day or do you need to expect them to pop up at any given time? If so, how are you notified about this? There’s no guarantee that more expensive tipsters are better than free ones, but you obviously need to take into account what the price is. Do a simple budget and see if the stakes you can afford generates enough winnings with this service even with the tipster’s fee deducted. You’ll see many services value are eaten up quite quickly unless you have a serious betting bank to start with. To keep track of all this info I would advise you to paper trade every single bet from the tipster services you want to follow. That means placing no money, or the smallest stake possible, to see if the tipster matches your wish list. Do this for a long time, until you feel certain this tipster fulfil all criteria and you feel comfortable investing your own money and following his advice (yes, it’s always a “him”). Set up an account at Bettin.gs to do this – it doesn’t take more than a few seconds to sign up and a few more seconds to register all tips. You can then track all this info and get stats like strike rate, odds, drawdowns, ROI, how often he’s beating the closing odds and a lot more. With all this said, here are a few services that might be worth keeping an eye on. Footnote: All the tipsters above have a partnership with Bettin.gs. Manage your settings in an easier way. Organize your tags, tipsters and bookies to get full control over your bets. You will be able to easily add, edit and delete all of these. Add your private notes about each tipster to remember your staking plan, strategy or other ideas about them. Set a starting bank to gain full control over your bankroll. This will also be used to calculate Return on Capital later on. More stats. More beautiful stats. Check your ROC for each tipster or your entire portfolio. Compare several tipsters, sports, odds intervals etc in the same graph. Keep check of drawdowns per tipster, sport etc. What the biggest losing run you or any of your tipster has been on? Knowing that helps to know how big starting bank you need to set aside. More stuff will come, but this is what to expect in a very near future. More details will come as soon as things are getting ready. As you might know, we’ve had an import function at Bettin.gs quite some time and as you also might know, it’s been somewhat in beta during this time. Today we’re happy to say that we’re leaving the beta version behind and that your imports should work just fine, as long as your file is set up according to the template that is needed. We’ve also added an export function, letting you export all the bets you’ve registered at Bettin.gs into a csv file, following the same template as the import. This makes it easier for you to back up your data externally, as well as managing your bets in an Excel sheet or whatever tool you’d like to use to crunch your data in. Both these features are available from the Settings page for all users. We’re happy to have gotten a few words with the users top of Hall of Fame at the moment with a mighty 97,3% ROI from 257 bets dating back to December last year – known as Goal Trader Syndicate. We are Chloe & Robert – the people behind ’Goal Trader Syndicate’ on Bettin.gs. Based in the UK and into sports both from a participation and betting perspective. How long have you been into sports betting? As as a hobby since around 2005 but in late 2013 we decided to focus on a small number of sports and adopt a more disciplined, mathematical approach. Today we bet and trade through exchanges and a few bookmakers. Most of our accounts are limited/restricted which although frustrating is a big compliment to get from a bookmaker as they simply don’t want your business. There’s only one reason for that – they don’t think you’ll make a loss long term. What sports do you bet on primarily? Horse Racing (UK) and occasionally tennis for our own private trading. Racing is high variance but the large odds offer significant opportunities to identify value and capitalise before significant market movements in the hours before the scheduled start time. How would you describe your approach to betting on that sport? The aim is simple – identify markets that present value and consequently will deliver profit long term. It’s important to not focus on whether a bet won or lost. When trading high odds (such as 10/1 or above) look at whether it presented value. If your selection loses by a neck to the odds on favourite it’s vital not be disappointed but instead focus on the fact that you were successful in terms of finding and backing a high value selection. We are great believers in this approach as it allows us to stick with the same philosophy and remain discplined when it comes to bankroll management. What would you say is the hardest part of sports betting? The aforementioned bankroll management. Many of our followers struggle to remain focused on the long term results. We were also guilty of this when we first started betting. Say 2-3 bets lose in a row (which will happen with a sport like horse racing) it’s tempting to raise the stake size for subsequent bets. In other words chase losses which inevitably leads to trouble. Measure profit over months and years – not days and weeks. We have achieved a Return on Investment (ROI) close to 100% with our tracked bets on Bettin.gs but during that time there have been bad runs. If we had thrown away the concept of bankroll management at any stage our overall results would no doubt be siginifantly worse. How long have you been using Bettin.gs? We have various accounts to track different sports and services but first joined a few years ago. How has Bettin.gs helped you in your betting? Do you have any advice on how to follow your bets? We publish all advised bets for horse racing each evening before the race day. So if you wish to follow our advisory you can gain access at https://bettin.gs/goaltrader. There is always plenty of notice given. As briefly discussed earlier though if betting with bookmakers expect limitations to be applied to your account. We would highly recommend trading via exchanges such as Betfair, BETDAQ & Smarkets to avoid these restrictions and often get higher odds. Do you have any final advice to people trying to make money from betting? Measure success over a decent time period – at least months. The mistake many make is getting bogged down in day to day performance. You can back a horse that presents great value for odds of 20/1. If you got those odds you will likely beat the SP and that bet can be considered a success. However the most likely outcome is still that horse will lose but long term bets with that mathematical edge will yield profit. On on the subject of SP (Starting Price) this is another interesting area when it comes to horse racing. There are various members of the syndicate who never actually wait for the race result. They simply back our selections when added to Bettin.gs the night before the race and then trade it on the day of the race. The idea being that the odds will have fallen (shortened) and so the exchange cashout feature will deliver profit. It’s not rare for our bets to be at 10/1 the night before but when the race starts to have fallen to 6/1 – 7/1 so there is siginifant potential in this strategy. As you might know, last week we added another one of the most requested features – the possibility to register each-way bets. No need to add bets for both win and place bets or workarounds anymore. Read more about how it works below. That’s it! The result and stats will be automatically calculated based on the info you entered. Good luck with your each-way bets, and as always for new features – if you find something you’re wondering about or improvements you’d like to see, let us know. As you might know, Bettin.gs was nominated in the SBC Awards in the category “Best betting website”. I want to thank you all who voted, and while our service didn’t manage to beat the big boys this time, I’d recommend you to take part of the results. There’s some quite interesting stuff in there. My favorite category “Worst bookmaker” makes for some fascinating reading, not least! 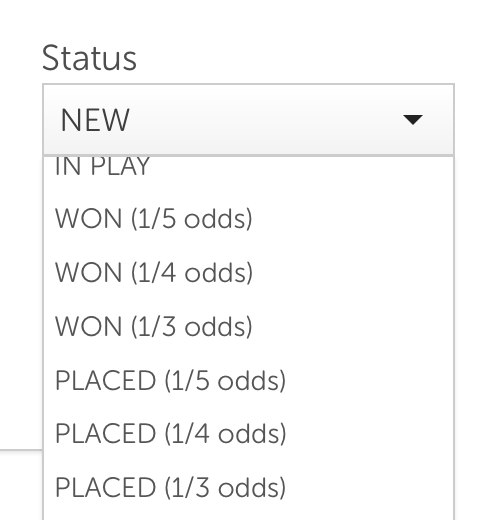 Nice to see Betfair, which drives much of Bettin.gs functionality up there. Here’s our category. No bad company to be in, that’s for sure. If you’re serious about betting and tired of keep looking around for the best odds or finding enough liquidity to place your bets, Sportmarket Pro is for you. Sportmarket Pro is a bet broker service, helping you as a bettor to get access to the best bookmakers in the world from a single interface. They’re not a bookmaker themselves, they just help you place the bets where you get the best odds, making the value work in your favour. Note that Sportmarket Pro is not for the small players – the smallest bet allowed is €50 or equivalent in your currency. If you’re ready to take the step from a hobby player to investing in sports, Sportmarket Pro is a must-have for you. Check out the Sportmarket Pro website and sign up today!